Sometimes all it takes to revive an old item that is headed for the bin is a little glue and some confetti. 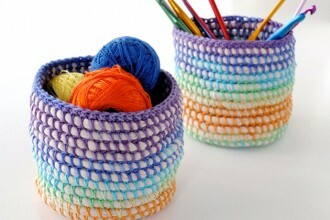 Yes, it’s amazing what a transformation a few colourful circles of tissue paper can make. I was almost on the verge of throwing my old sunglasses case out because the fabric outer was very dirty and quite shabby, the inner lining was damaged too. I’ve transferred my everyday sunglasses to a soft cover that takes up less room in my handbag, so I didn’t have much use for this sad looking case. 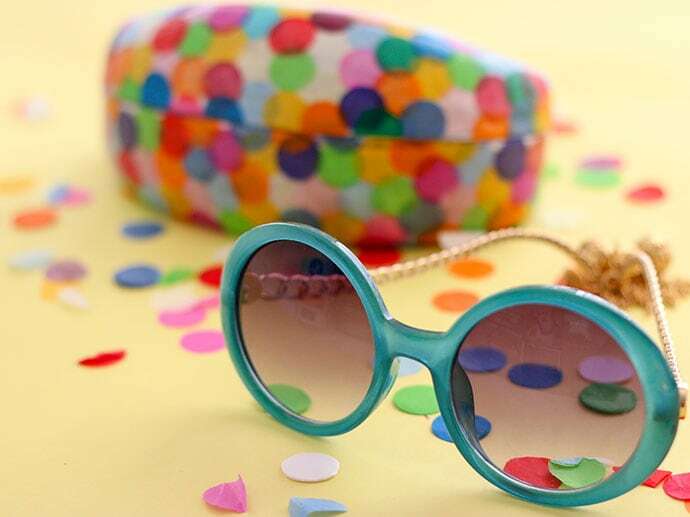 But as I was tidying up my accessories, I realised my old case would be perfect for protecting my ‘Party Sunnies’! 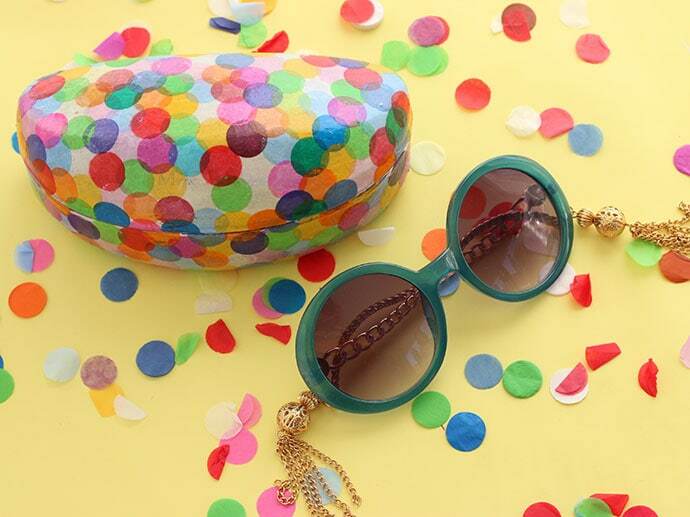 Of course sunglasses with gold tassels need a festive matching case, so the only thing for it was to get my decoupage on and cover it in confetti. This is a super easy project, and the same technique can be used for any object with a hard surface. 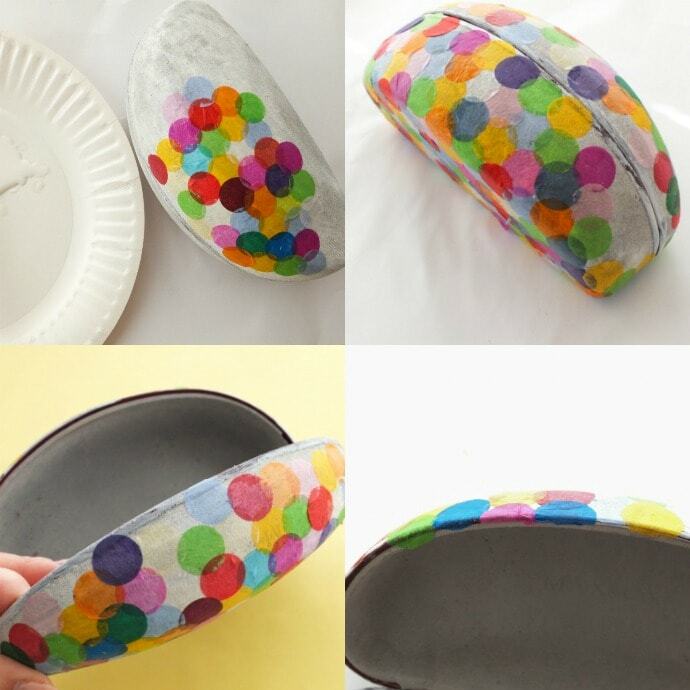 Try it on bangles, headbands, or even a hard shell clutch bag. 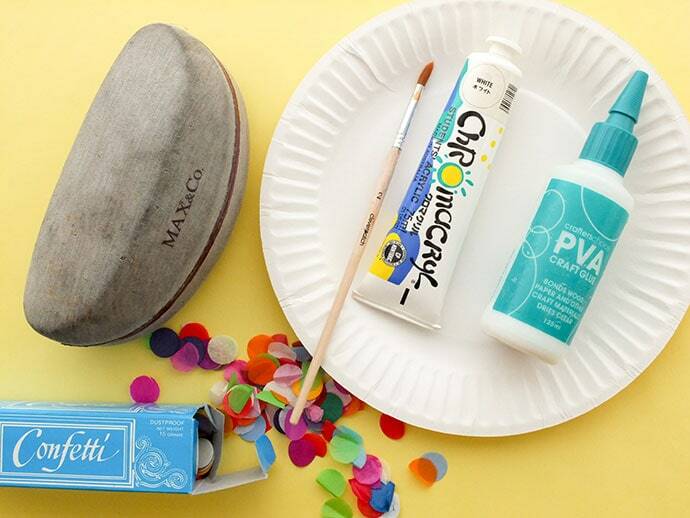 Start gluing on your confetti spots with small dabs of PVA glue or Mod Podge, work on spot at a time. 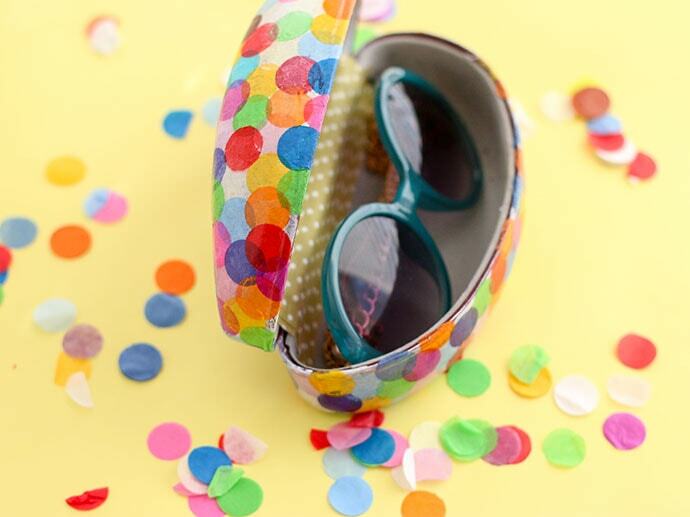 Let the confetti overlap slightly to allow the colours to blend where edges touch. 5. Carry on until the whole case is covered. On edges fold confetti over sides and trim excess. 6. 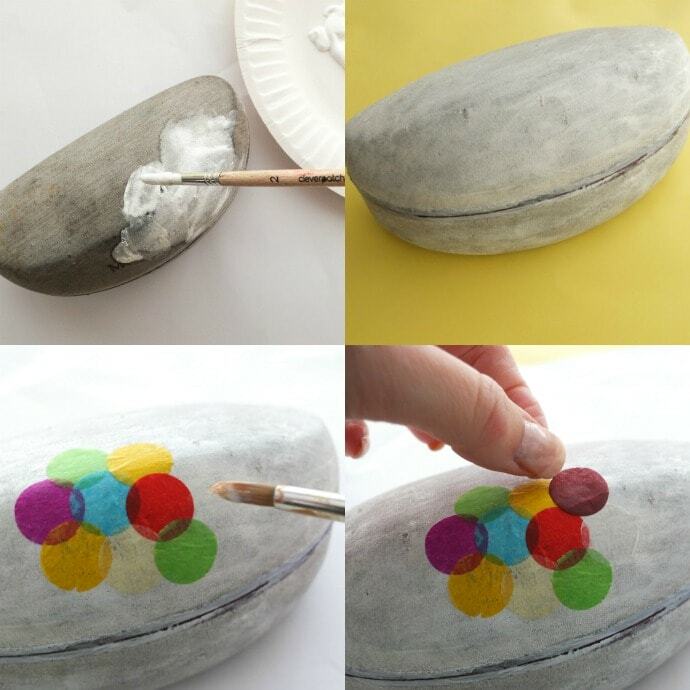 Leave confetti to dry before covering in a thick layer of PVA or Mod Podge. I’ve balance my case over a small container to allow access on all sides without having to touch it. Leave to dry fully, the glue will dry clear and provide a resilient protective coating. 7. I repaired the cracked interior with some adhesive fabric tape that I had on hand. All done! That was pretty easy. Have I given you a bright idea? 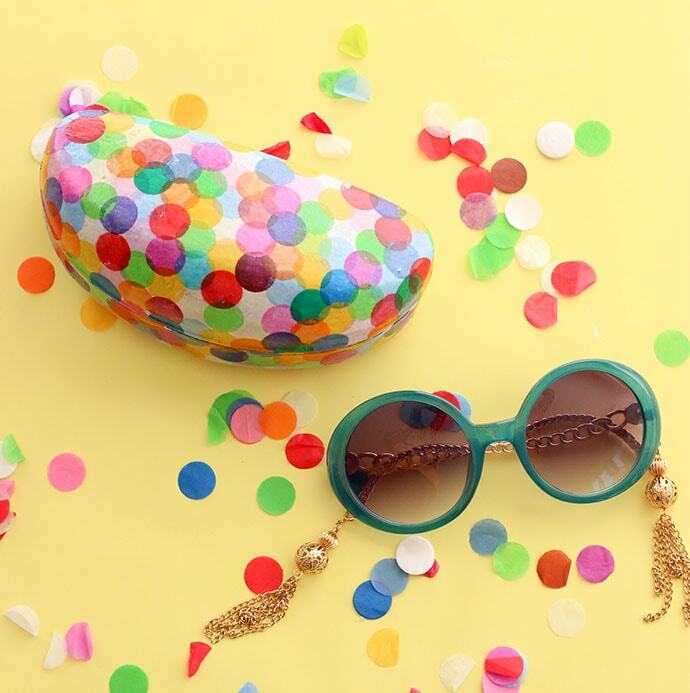 What will you be covering in confetti? Next articleFried Egg Earrings – An Eggcellent Idea! Case “revived” to be FABulous! 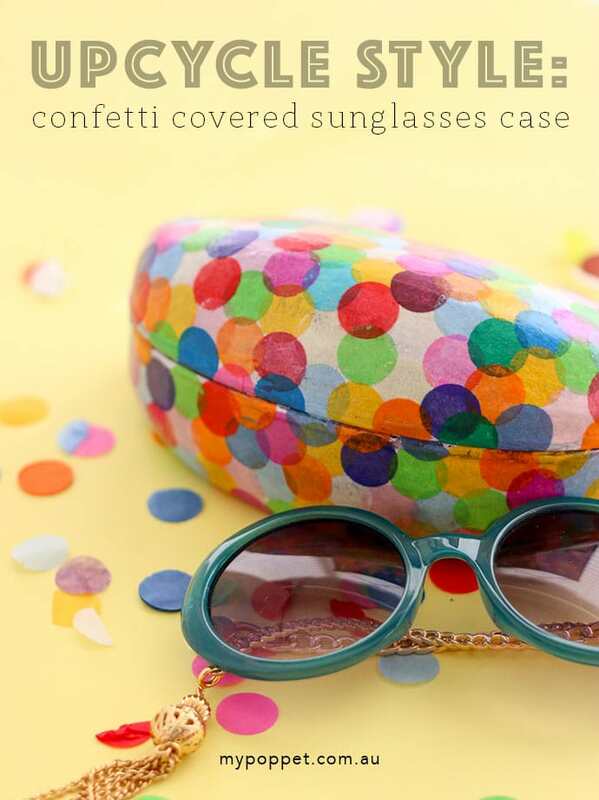 Those confetti circles certainly added PIZZAZZ! 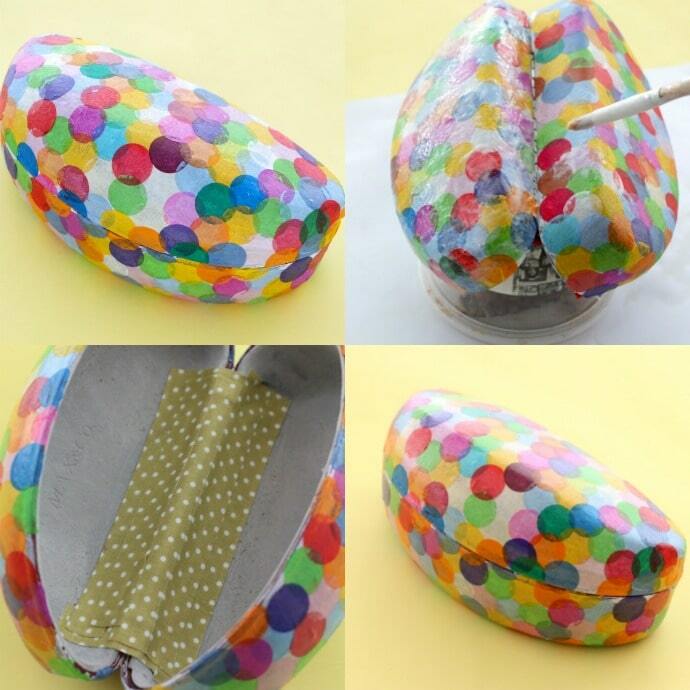 Another “up cycle” project that sure to inspire others– & easy! Thanks for sharing, Cintia! Oh my goodness, mine’s exactly the same case I think and the same thing has happened – I’ve pulled most of the fabric off but what a wonderful idea you’ve had … As usual. Thank you. You could also try using fabric instead of confetti. Oh I wish I had seen this post before I tossed my sunglasses case that was falling apart! I could have revived it. Well, lesson learned. Your project turned out so cute! Thanks for posting it!